The introduction of shared spaces and the removal of traffic signs, formal traffic control and signal controlled junctions is gaining momentum in European towns and cities as part of a European Union supported initiative. Spiegel Online reported last week on the German town of Bohmte where road signs and traffic regulation are being abolished. This report follows on from an earlier article last year which announced the EU experiment. 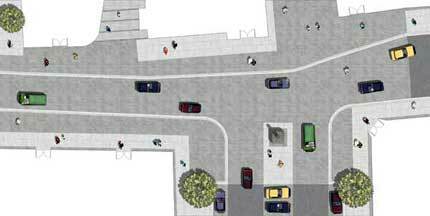 extending pavement activities to the edge of the street, further emphasizing the idea of shared space. ensuring eye to eye negotiation of right of way by human interaction rather than commonly ignored signs. eliminating kerbs – instead of a raised kerb, pavements or footpaths should be denoted by texture and colour. In the UK, this approach to traffic and people has been promoted particularly by Martin Stockley and by Ben Hamilton-Baillie who recently carried out a series of case studies for CABE on better street design. 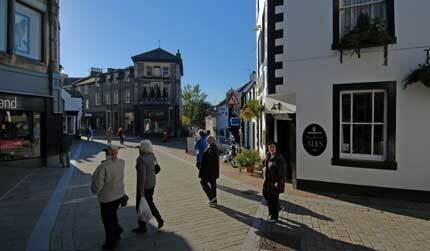 We have worked with Martin Stockley on proposals for Renfrew Town Centre and Keswick. We have also promoted shared surfaces and a more flexible approach to traffic and pedestrian interaction in proposals for Keith, Ardrishaig, Nelson and St Helier. This approach is reflected to some extent in the Department for Transport’s design guidance Manual for Streets which marks another gradual move towards higher standards of street environments. There is a report and description of related work in Kensington High Street, London here. Glasgow’s M74 Extension – a view from the road?